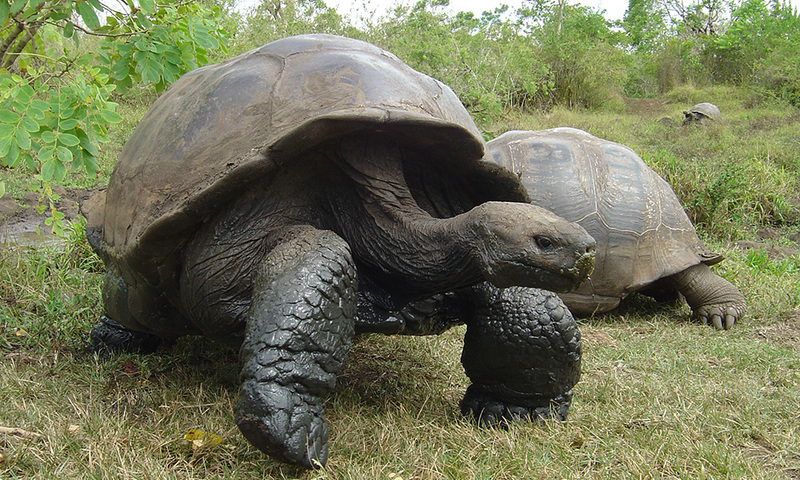 The most famous resident of the Galapagos Islands is the Galapagos giant tortoise. In fact, the very word 'Galapagos' derives from an old Spanish word for tortoises! The Galapagos giant tortoise is one of the most famous animals of the Islands, with the Archipelago itself being named after them (Galapágo is an old Spanish word for tortoise). The giant tortoise arrived in Galapagos from mainland South America 2-3 million years ago, where they underwent diversification into 15 species, differing in their morphology and distribution. After the death of Lonesome George in 2012, the last Pinta island tortoise, ten living species remain in Galapagos for certain. Their population is currently estimated at 20,000 individuals. Giant tortoises show large variation in size and shape but all 15 species can be classed into two main shell types: domed and saddle-backed. Dome-shelled tortoises lack an upward angle to the front of their carapace (shell), restricting the extent to which they can raise their heads. They tend to live on large, humid islands where there is lots of vegetation to eat. Saddle-backed tortoises have an upward curve to the front of their carapace, which allows them to stretch up to reach higher growing plants. They tend to live on arid islands in Galapagos, where food is less abundant. The Galapagos giant tortoise spends an average of 16 hours per day resting. The rest of their time is spent eating grasses, fruits and cactus pads. They enjoy bathing in water, but can survive for up to a year without water or food. Small birds, such as Galapagos finches, can often be seen sitting on the backs of giant tortoises. The birds and tortoises have formed a symbiotic relationship in which the birds peck the ticks out from the folds of the tortoises’ skin. Breeding primarily occurs during the hot season (January to May), although mating may be seen at any time of year. Mating may last for several hours, with the male making loud roaring noises throughout. After mating, the female migrates to a nesting area, where she digs a hole with her back feet into which she lays 2 to 16 eggs, each the size of a tennis ball. The eggs are incubated by the sun, with the young tortoises hatching after around 130 days. Where to see them: The Santa Cruz highlands and Alcedo Volcano on Isabela have the largest populations of giant tortoises. Populations can also be found on Santiago, San Cristobal, Pinzon, and Espanola. 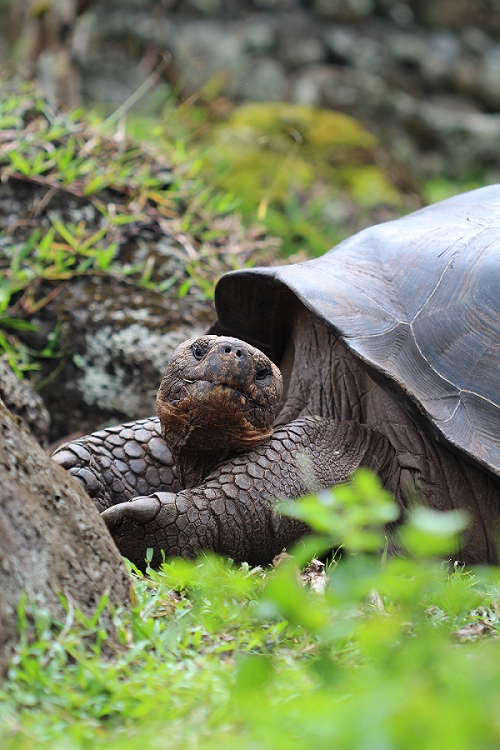 When to see them: Galapagos giant tortoises are present all year round. They are most active at midday during the cool season and early morning or late afternoon in the hot season. Threats: Galapagos giant tortoise populations suffered huge declines due to exploitation by whalers, buccaneers and fur sealers. The tortoises provided a source of fresh meat which could be kept alive on a ship for several months without any food or water. This resulted in the loss of between 100,000 and 200,000 tortoises. They were also exploited for their oil which could be used for burning in lamps. 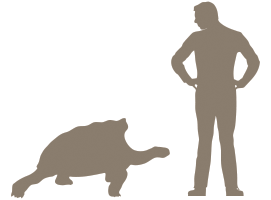 The introduction of several species by humans has had further devastating effects on tortoise populations. Rats, pigs and ants predate tortoise eggs; feral dogs attack adult tortoises; cattle and horses trample nests; and goats compete with tortoises for food. 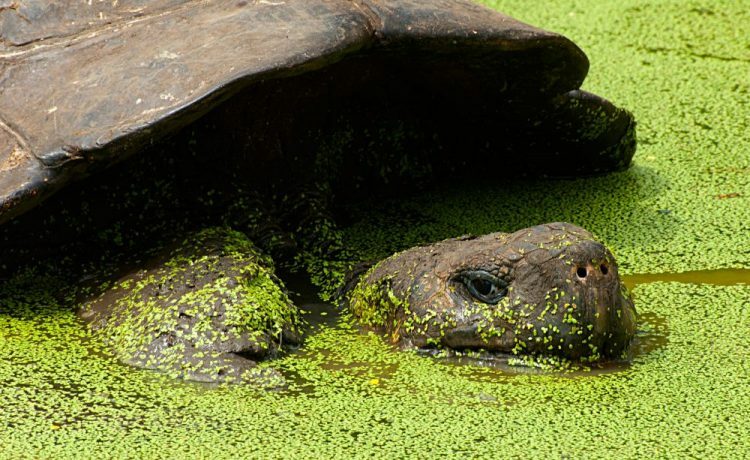 At least three species of giant tortoise are thought to have gone extinct – including the Pinta tortoise, whose last known survivor (Lonesome George) passed away in June 2012. Following the establishment of the Galapagos National Park, eggs were collected from the wild and incubated at the Charles Darwin Research Station. Keeping the newly hatched tortoises in captivity allows them to grow big enough to escape attacks from rats and dogs once they are released. Eradication campaigns are under way which aim to remove the introduced species that threaten the survival of tortoises. The Galapagos Tortoise Movement Ecology Programme, co-funded by GCT, is helping to improve our understanding of giant tortoise migration so that more effective management plans can be implemented. 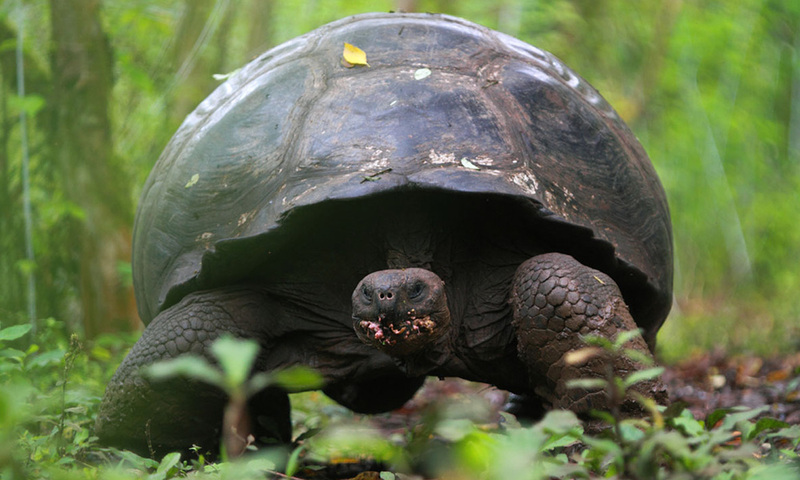 You can help us protect Galapagos giant tortoises by donating today! 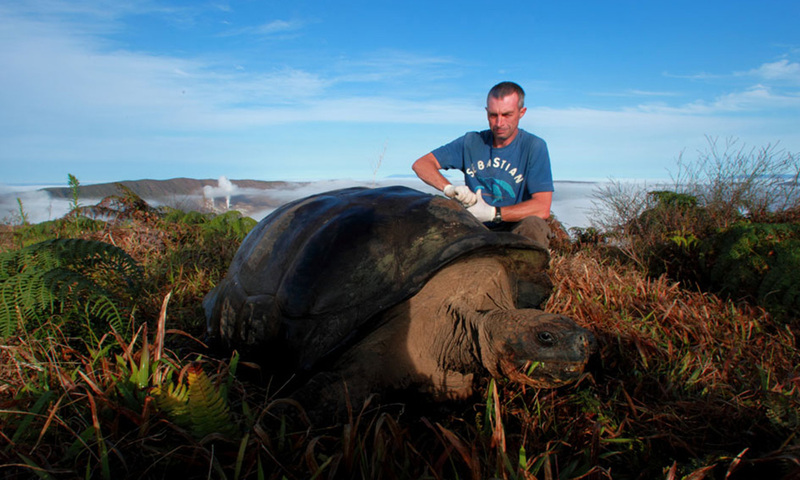 The film captures the hidden mystery of the lives of Giant tortoises, one of the longest lived vertebrates on Earth. 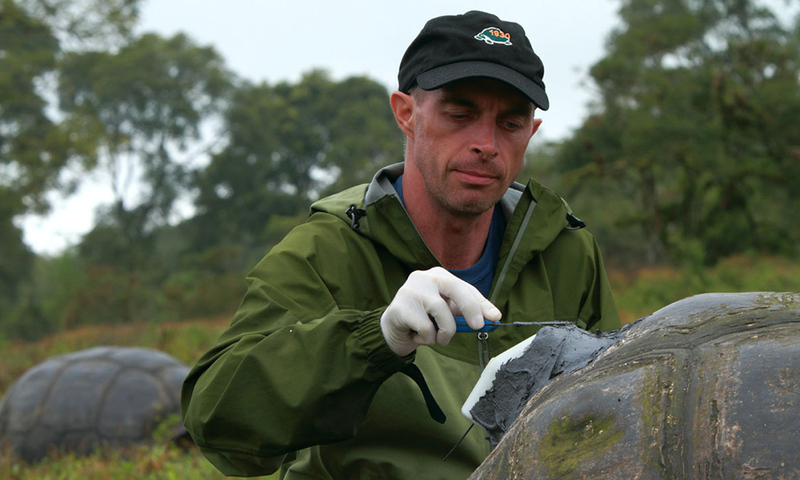 The Galapagos Tortoise Movement Ecology Programme is using cutting-edge technology to track giant tortoise migration.